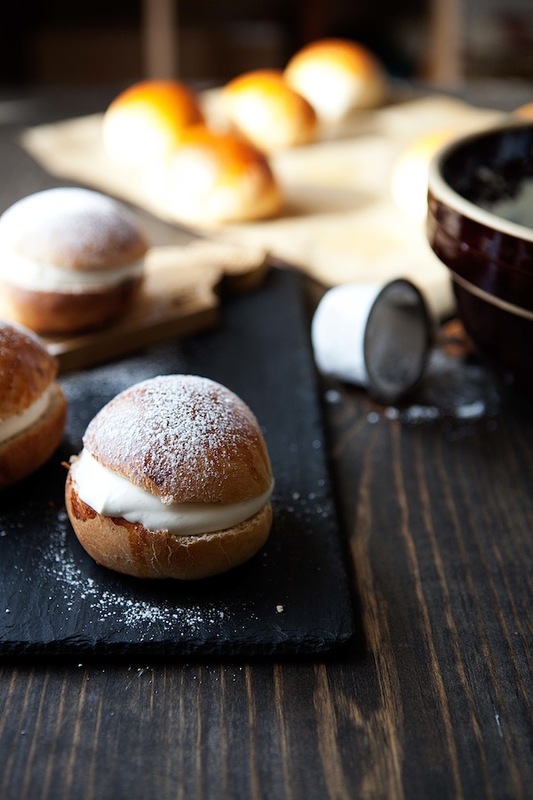 The best known of the Fat Tuesday buns are the Swedish semlor (the plural of semla). Theirs are sweet cardamom buns filled with almond paste and whipped cream. If you’d like you can drown them in warm milk before serving. 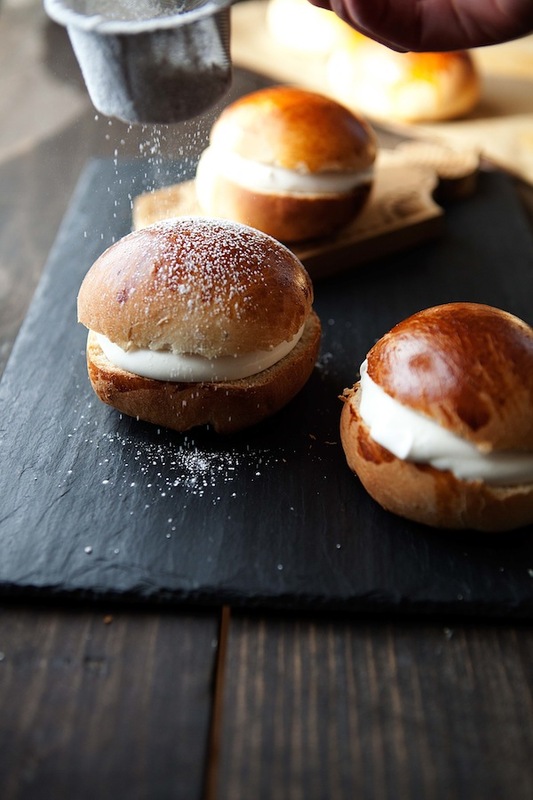 Danish and Icelandic Fat Tuesday buns are more like pate a choux, stuffed with whipped cream and jam and topped with chocolate (and here I must also admit that the Icelanders actually eat theirs on the Monday before, which they call bun day. Those Icelanders, always trying to be different…). 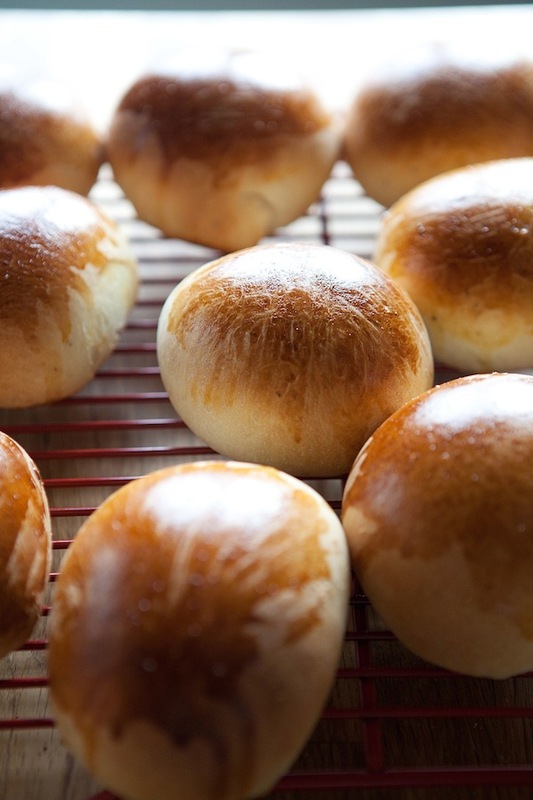 Norwegian fastelavens boller may be the simplest of the bunch, but I adore them. 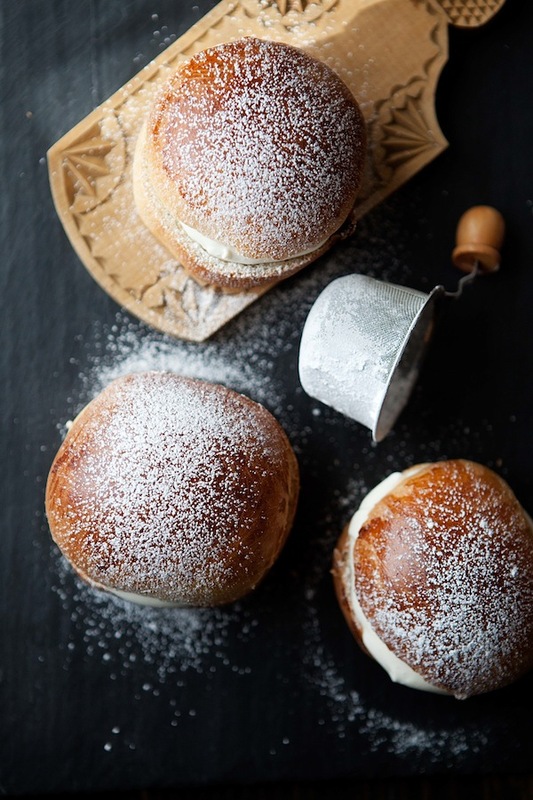 They’re extremely similar to semlor, but without the almond paste (at least in my family, I suppose others may use it). You bake up yeasted cardamom buns, often studded with raisins, filling your house with the fragrance of spice and yeast. Then you have to wait until the buns cool completely, which of course is absolute torture, but you don’t want them melting your whipped cream, you see. Once sufficiently cool, whip up a batch of sweetened heavy cream, slice your buns in half, fill them with the cream and sprinkle them with powdered sugar. It’s that simple. Yet, somehow in the eating they are so very much more than the sum of the flavors and the textures. They’re perfection. Rich brioche like crumb against fluffy clouds of cream, vanilla and cardamom intermingling with bursts of sweet raisin. Then there’s the portion where the crumb and the cream meet and meld into a silky texture like perfectly fresh bread spread thickly with good butter. I don’t know. They kind of defy words. Besides Norwegian Birthday cake and fresh lefse, these are my very favorite treat. Actually, they may even win out over those other two. I’m doing a terrible job adequately conveying how very spectacular Fat Tuesday buns are, so what the heck! Just make them. Then you’ll know what I mean, and we can chat about it, or we can just quietly pick at our plates to make sure we eat every last remaining crumb. In a large mix bowl (or standing mixer with a bread hook) mix together the warm milk, melted butter, sugar, and yeast. Allow to stand for about 10 minutes, until the yeast is good and foamy. Stir in the salt and cardamom. Then stir in the flour until all incorporated (stir in the raisins at this point too). The dough should still be a bit sticky or tacky, but not stick terribly to your fingers if you tap it. Knead by hand or with the bread hook until supple (but probably still slightly sticky! ), about 8 minutes. Cover the bowl with a cloth or plastic wrap and allow to rise in a warm place for about hour (until about doubled in size). In the meanwhile, line two cookie sheets with parchment paper. When the dough has risen, turn it out onto a lightly floured surface and break it into equal size pieces, a bit bigger than the size of a golf ball. 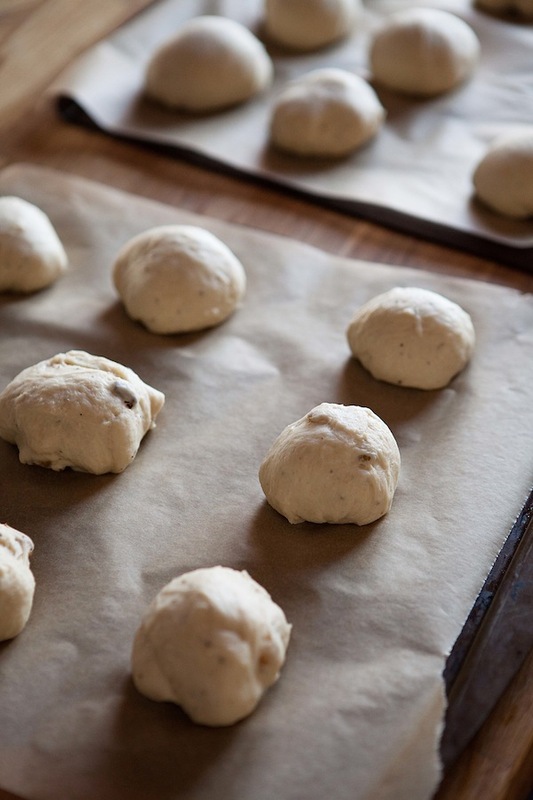 Shape each piece into a ball and place them on the baking sheets. Cover with clean dish cloths or plastic wrap and let rise somewhere warm for another 30-45 minutes. Preheat the oven to 350F. Before baking, whisk the egg and brush the tops of the buns with it. Bake one sheet at a time for about 20 minutes, until deep golden brown on top. Allow to cool completely, then slice the top off of each bun. Whip the cream with the vanilla and 2 Tbs. powdered sugar until stiff peaks form. 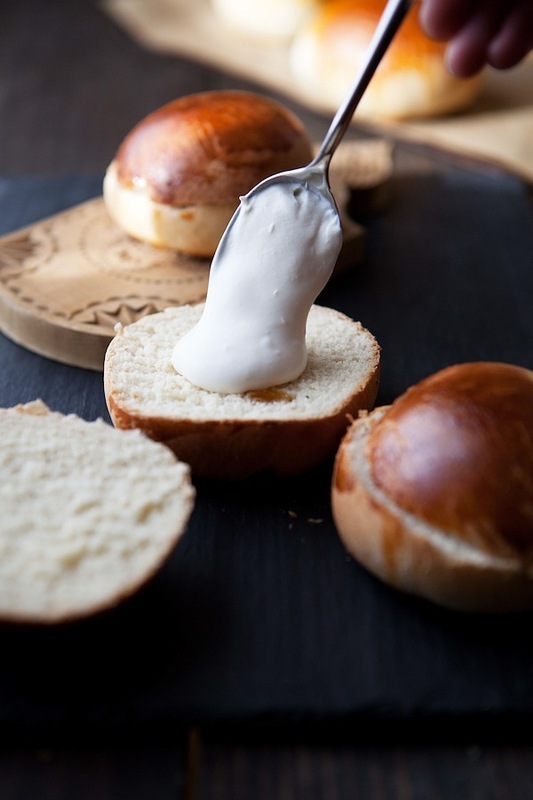 Place a scoop of whipped cream on the bottom portion of each bun, the cover each with the top that you removed. Dust all the buns with powdered sugar and serve. A note about eating the buns: it’s fun to try to eat them like a sandwich, but it’s invariably messy as the whipped cream squirts out and all over the place. If you’d like a neater experience, split your bun back open, divide the whipped cream evenly between the two sides and eat each as an open face little miracle of cardamom bread and whipped cream. Oh these look beyond scrumptious!!! I have the ingredients, I may have to make them with my beniegs and coconut pancakes tonight.. It is far Tuesday after all!! Thanks for sharing, can’t wait to try them! wowww Emily! These look incredible. and I thought you described them beautifully. I want to make them immeditely! 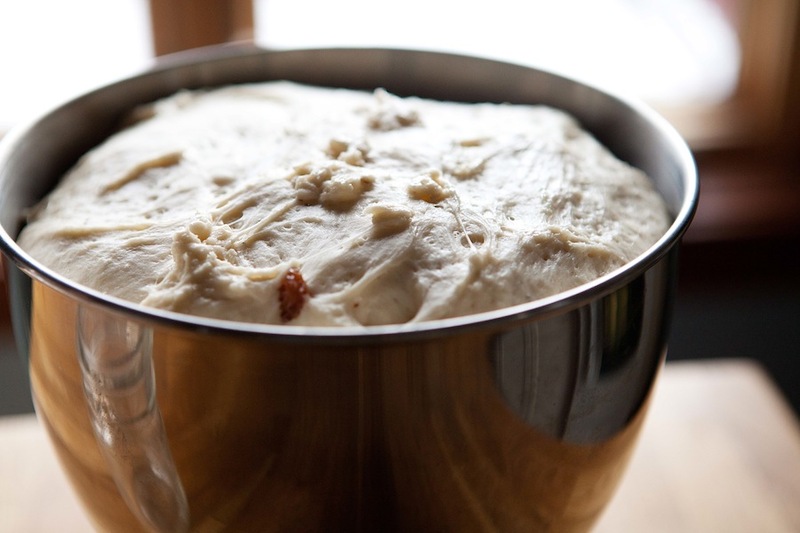 Yeast doughs usually require a weekend, though, for me, so I suppose.. a few more days to wait! Thanks for sharing such a delicious tradition! Yum! I can’t wait to try them! photographing one of my favorite things ever doesn’t hurt! These look heavenly! And I love that your sharing traditions. I admit to knowing very little about Norwegian food or culture, so it’s fun to learn something new…especially when it’s this delicious! Thanks! I enjoy sharing my traditions. And I love learning about others’ as well! These look so good — subtly sweet. I’m sorry not to have gotten to this recipe in time for Fat Tuesday. But I will try them out anyway. Traditionally, is the cream always flavoured with vanilla? In my experience the cream is always flavored with vanilla. In Scandinavia you buy something called “vanilla sugar” which is kind of like a powdered sugar flavored with vanilla bean. Here, I try to get the same effect with powdered sugar and vanilla extract. These bollers look fabulous! When I have been to Norway two years ago, I tasted a lot interesting pastries. So I’m happy to get a little reminder of that time by marveling at your nice photos. Happy to thus get to know your beautiful blog as well. They do have a lot of wonderful pastries there. I love their ice cream too. I saw a recipe for these in Scandilicious cook book and have been wanting to try them for ages! Signe Johansen makes them with the addition of marzipan. These look delicious! I hope you get a chance to try making them some time. They are very delicious! It’s also definitely traditional to use marzipan, especially in Sweden, but my family never has. 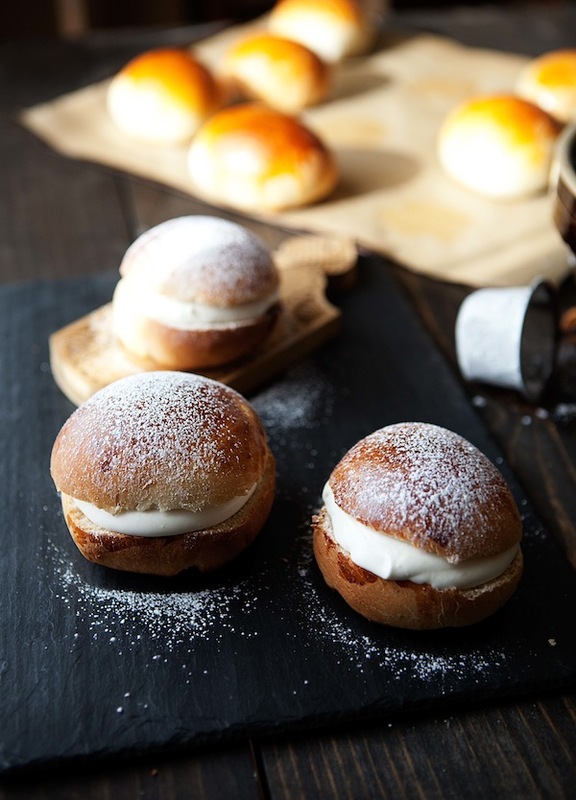 You are currently reading Fastelavens boller (aka Norwegian semlor) at Five And Spice.